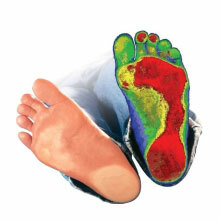 Did you know that each of our feet contain 19 muscles, 26 bones, 33 joints and 107 ligaments? Proper foot support is critical to your overall health and well-being. Orthotics are orthopedic devices that are used to correct foot disorders or alter your gait to relieve stresses that can cause pain throughout your body. These precision medical devices are custom formed for each individual to adjust and control the function of the foot and its alignment with the lower leg. They can treat and prevent injury-causing motions such as excessive pronation (collapsing in) and supination (rolling out) and make standing, walking and running more effective. Some orthotics are designed to redistribute pressures on the bottom of your foot to alleviate pain from corns, calluses and bony prominences. Individual appointments are available for orthotics at our clinic today! Most employee benefits plans cover orthotics - be sure to check your plan if you are in need of orthotics.